In several parts of the world, the demand for dairy blends is on the rise, especially among the health savvy due to its low fat content. Individuals are increasingly using dairy blends in place of pure dairy blends that are at par in taste to the latter. Composition-wise, dairy blends are mixtures with a base of concentrated cream or butter. The butter or cream concentrate is further added vegetable oils to give a spreadable texture. The mixture is added with salt, sugar, flavorings, or aroma for taste and for longer shelf life. The price factor of dairy blends over pure dairy products is another key factor for the demand of the former. Dairy blends when mixed with soy or other protein adds to the nutritional value diminishing the cost further. On the downside, high concentration of preservatives that have health implications, and subpar taste as compared to pure dairy blends are holding back the growth of dairy blends market. 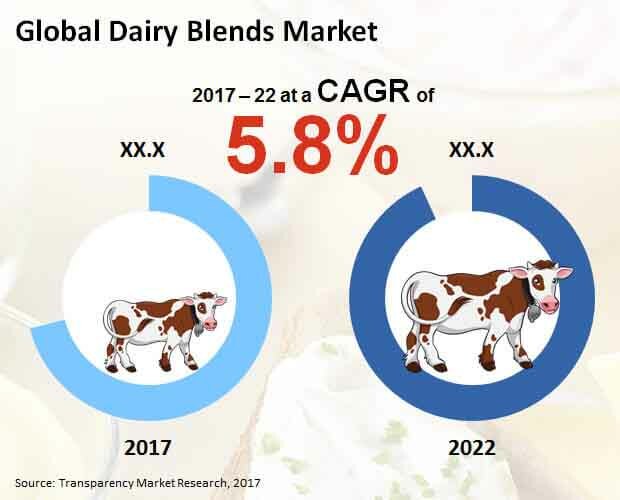 According to a report by Transparency Market Research (TMR), the global dairy blends market is likely to rise at a CAGR of 5.8% for th forecast period between 2017 and 2022. Exapnding at this pace, the market which stood at US$2,853.7 mn in 2017 is likely to become US$3,789.3 mn by 2022-end. The global dairy blends market is segmented on the basis of product type, form, and region. By product type, the key segments into which the dairy blends market is divided are dairy mixtures, functional ingredients, dairy/non-dairy ingredients, carrier, and others. Among them, dairy mixtures hold the leading share in the overall market. The dairy mixture segment is likely to stay at the fore over the 2017-2022 forecast period. On the basis of form, the dairy blends market is segregated into powder, liquid, and spreadable. Geography-wise, the global dairy blends market is divided into North America, Latin America, Asia Pacific except Japan, Europe, Japan, and the Middle East and Africa. North America, among all, is the leading consumer of dairy blends. The U.S. displays the leading demand for dairy blends in the region. This is mainly because of excessive consumption of processed spreads, dressings for sandwiches, salads, and meats. Going forward too, in the years ahead, U.S. is likely to be a leading consumer of dairy blends in North America. Europe is a key consumer of dairy blends too. Excessive demand for packaged sandwiches and salads that are sold at salad bars, delis, and specialty food stores display demand for dairy blends. Small food units that manufacture salads and sandwiches use dairy blends for creaminess to these foods. Longer shelf life and low cost of dairy blends over pure dairy blends also accounts for their increasing use for packaged sandwiches and salads. Prominent companies operating in the global dairy blends market include Cargill Inc., Agri-Mark Inc., Dohler GmbH, Agropur Cooperative, Fonterra Cooperative Group Ltd., Koninklije Viv Buisman B.V., Advanced Food Products LLC, Hormel Foods Corp., Kerry Group plc,., and All American Foods Inc.